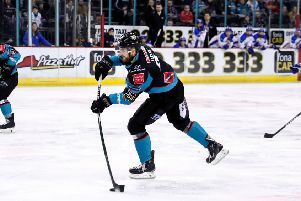 The Stena Line Belfast Giants return to the ice this weekend for three vital games in the race for the Elite League championship. Belfast have cut the gap at the top to three points behind the Cardiff Devils with 18 games remaining, after trailing by 11 points less than two weeks ago. The opponents on Friday night and Saturday are the Guildford Flames with face-off at both games 7pm at The SSE Arena. The Giants then travel to face the Nottingham Panthers on Sunday where the puck drops at 4pm. The Giants now face six games inside the next ten days with the Glasgow Clan the opponents on three occasions next week following this weekend’s games. “It is always a tough games against the Flames, over the last two seasons since they entered the league,” said Keefe. With three games in three days coming up this weekend, the Giants will look to take each game as it comes and not look too far ahead. The Giants Head Coach knows how important each game is, especially at this stage in the Elite League season. Despite clawing back points on the league leaders in recent weeks, Keefe is not getting too carried away with his team’s recent form and wants his side to remain focused on the tasks at hand this weekend. “It is certainly tight at the top, though after the weekend it could all change.